Like the bartenders of your dreams, or perhaps nightmares, the Brother’s Hedblade have mixed up another musical cocktail sure to sooth your post holiday blues. Step into STR’s Hole In The Wall, pull up a bar stool next to Billy Larkin & the Delegates and start things off with One Mint Julep from the ‘Genius” himself Ray Charles. Then follow that up with Slim Gaillard’s inebriating Atomic Cocktail, and chase it down with one of Buddy Merideth’s ice cold Flop Top Beers. Just let the Intoxica of The Revels pour into you, and before you know it you’re gonna be best buddies with music legends Amos Milburn, Wynonie Harris, Bert Keampfert and a whole slew of wild and tuneful barflies. You’ll be saying I Got Loaded like Lil’ Bob and the Lollipops and happily end up Hung Over courtesy of the Martini’s. 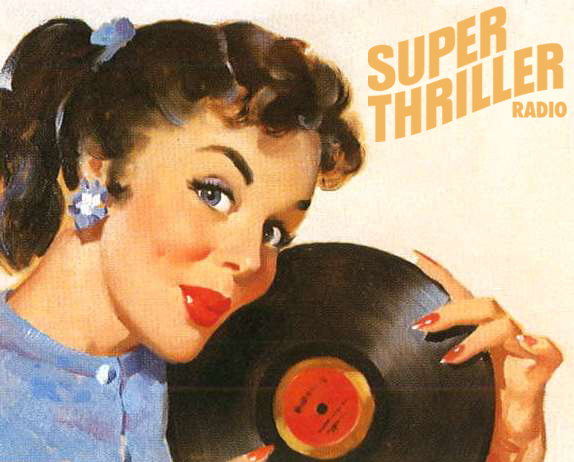 Oh yes, Rhythm and Booze lovers, we know you’ll agree with Jim Backus and Friend when they laughingly tell you this “spirited” episode of Super Thriller is Delicious! It don’t matter if you’ve been Naughty or Nice, ‘cause just in the St. Nick of time, The Brothers Hedblade have gathered a sleigh full of musical sugar plums and there ain’t a lump of coal in the bunch. Oh, we know what you think about Christmas music, but forget all that reindeer crap ‘cause this year “Santa Done Got Hip” – just ask The Marquees. Yep, Jimmy Butler’s coming over to “Trim Your Tree” and Pearl Bailey gonna put a “Five Pound Box of Money” under it! Oh yesiree kiddies, as Oscar McLollie and his Honey Jumpers will attest, you’re goin’ to “Dig That Crazy Santa Claus”. And, we’ll stuff your stockings with vintage Yultide commercials, Super Thriller’s special Holiday edition of "Spin The Wheel” and like the Ghosts of Christmas Past, exclusive STR beyond -the-grave Celebrity Holiday Greetings! So don’t worry Daddy-o Tony Rondelle Larson insures this won’t be Xmas in squaresville -no way, this is a very, very “Cool Yule”. - Happy Kringle – Like, Dig?! * CAUTION – Some Harsh Language - Parental Discretion Is Up To You. Pull up a chair, grab your napkin and bring a funky appetite ‘cause The Brothers ‘Blade have cooked up one hellava tasty Turkey Day show. On their swingin’ musical menu tonight, Menard Rogers and friends have prepared a ton of rare, raunchy and rockin’ Good Food. For starters might we suggest some of Clarence & Calvin’s mouth-watering Rooster Knees & Rice, or perhaps Chef Gunga Din’s famous Crabcakes? Then for your main course there’s Joe Swift’s succulent Alligator Meat, or Wendy Wren’s saucy Memphis Bar-B-Q and for those on a budget, cook Louie Jordan’s special Boogie Woogie Blue Plate. And please folks, don’t forget our incredible sides – we have Johnny Adam’s New Orleans style Funky Onions, Tommy Smith Jr.’s one and only Cold Slaw and there’s always Mo’ Taters from The Earthworms topped off with a luscious heapin’ ladle of King Cole’s original Frim Fram Sauce. Now sit back and enjoy, and don’t worry about a thing, ‘cause as Cab Calloway says, Everybody Eats When They Come To [Our] House! Brothers Hedblade Haunted Hootenanny. HEAR! The teenage lycanthrope woes of The Cramps. SEE! The Ted Cassidy dance craze The Lurch. FEEL! Your blood run cold to Eddie Womack's Psycho. And SCREAM! At Roky Erikson as he Walks With The Zombies. Plus, hear vintage Grind House Drive-In movie trailers, Super Thriller’s special "Spin The Wheel" feature, and our exclusive interview with the legendary Screamin' Jay Hawkins! Jay & Jocko lay down a heaping slab of hip and sleazy sides from music's lost hereos. You'll Keep It Cool with Terry & the Chain Reaction, Emanuel Laskey serves up a funky slice of Welfare Cheese, take a swingin' trip to 1968 Mexico with Esquivel, stomp Roaches with Mask Man & the Agents, Brook Benton will belt out his fat Hit Record and dozens more wild and raunchy '60's underground gems. Plus, vintage TV commercials, exclusive Celebrity shout outs, and our special "Spin The Wheel" feature. Let's Dance!